description for "Winter Squash and Pumpkins: Cucurbita maxima, 'Lakota'"
Cucurbita maxima 'Lakota' is a gorgeous teardrop Hubbard-type squash. 'Lakota' is prized by the Lakota Sioux Indian tribe. It exhibits decorative qualities with a sweet and nutty, deep-orange flesh. 5-7 lb.fruit. Planting depth: .5-1 inch. Days to germination: 3-7 days. 90 days to maturity. 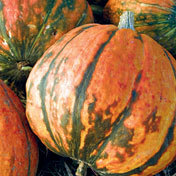 reviews for "Winter Squash and Pumpkins: Cucurbita maxima, 'Lakota'"